largest environment threat to our country. efficient, they can also lead to a number of filtration problems. are carried and recirculated through the house via air ducts. Typical 1" throwaway filters only trap about 5-15% of polluting particles. Biological Contaminants- bacteria, mold, mildew and more. furniture, insulation, hobby projects and more. 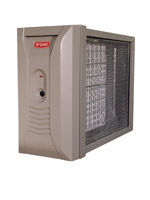 Change your A/C filter according to manufacturer's recommendations. Bathe pets regularly and keep pet beds and litter boxes. Have your ducts cleaned professionally. lights. Give us a call today to set-up a time to look over your solutions.